The Judicial Performance Commission for the Twentieth Judicial District unanimously recommends that Judge Patrick Butler BE RETAINED. Judge Butler earned a bachelor’s degree from Keene State College in New Hampshire and a law degree from Gonzaga University. He was a partner at Lamm & Butler from 1987 to 2009, where he focused on civil and criminal litigation. He was also an instructor of law at Kaplan College in Thornton from 2005-2009. 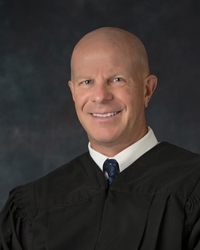 In 2009, Judge Butler became a magistrate in the 18th Judicial District, where he worked until his appointment as a District Court Judge for Boulder County on October 3, 2011. In his first few years on the bench, Judge Butler has spent approximately half of his time in domestic relations and half of his time in criminal matters. Both attorneys and non-attorneys praised Judge Butler for his calm, respectful, and accessible demeanor. With respect to weaknesses, some attorneys commented that Judge Butler lacked knowledge in certain areas of domestic relations law and, at times, favored the speedy resolution of matters over reaching a correct result. The Commission is confident that Judge Butler is cognizant of these issues and is addressing them, and will continue to develop into an excellent jurist.